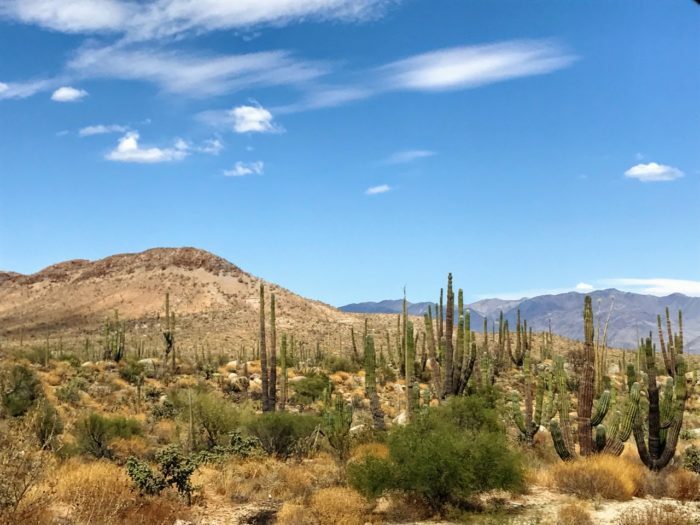 Chances are, if you’re a tourist taking the Baja Ferry from Topolobampo to La Paz, you’ve just rolled off Mexico’s splendid Copper Canyon Train (El Chepe as it’s known locally) and are looking to explore Baja California. 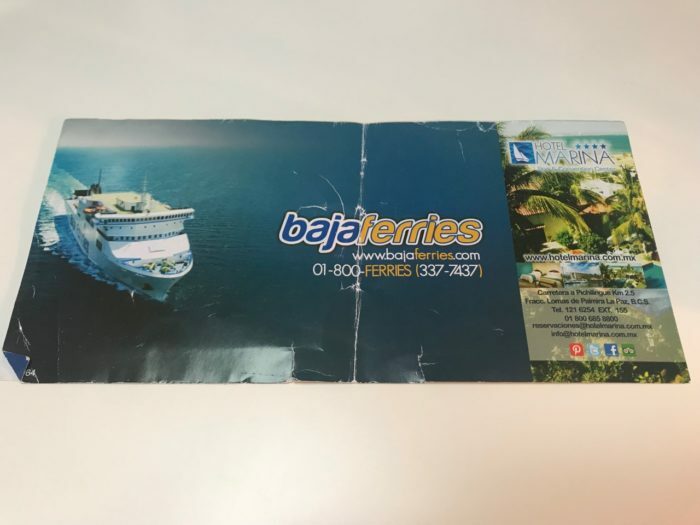 In this post, I’ll give you all the information you need to take the Baja ferry from Topolobampo to La Paz, starting in Los Mochis. Of course, you can do this trip in reverse. I took the Baja Ferry to La Paz as part of a broader trip when I travelled from coast to coast across Mexico from Cancun to Baja California. It’s a trip that took months and I’ve still yet to write up my full Mexico itinerary. For now, this post on taking the ferry from Los Mochis to la Paz, is just another instalment. If you’re at the beginning of your Mexico trip planning, you might find these previous posts useful. Bye bye Los Mochis (technically Topolobampo). As an intro, I’d say that taking the Baja ferry is an affordable, fun and simple trip to take. It does require a bit of planning because the ferry doesn’t run every day. And, because boarding the ferry can take a ridiculous amount of time, it may not work with your Copper Canyon train timing. I cover all of this in more detail below. I’ve also created a Google map with all the locations mentioned in this post, including the Los Mochis Copper Canyon train station, the ferry terminals in Topolobampo and La Paz, some hotel options in each city and, in case you eventually decide to fly, the airports in each city. You’ll find a link to the map at the end of this post. So, let’s get stuck into the details of how to take the Baja ferry from Topolobampo to La Paz. What are the Baja Ferry routes to La Paz? The Baja Ferry has two routes to and from La Paz. The one I talk about in this post is the route from Topolobampo (the closest ferry terminal to Los Mochis) to La Paz, on the Baja California peninsula. There is a second route between Mazatlán and La Paz. Mazatlán is also on the mainland of Mexico but is much further south of Topolobampo so make sure you’re looking at the right route and schedule when you book. Does the Baja ferry to La Paz run every day? In short, no. The ferry sails six times a week from Topolobampo to La Paz, with no ferry on Saturday nights. However, do check for your specific dates as sailing days and times can change depending on the season and the whim of the captain (just kidding…I think). 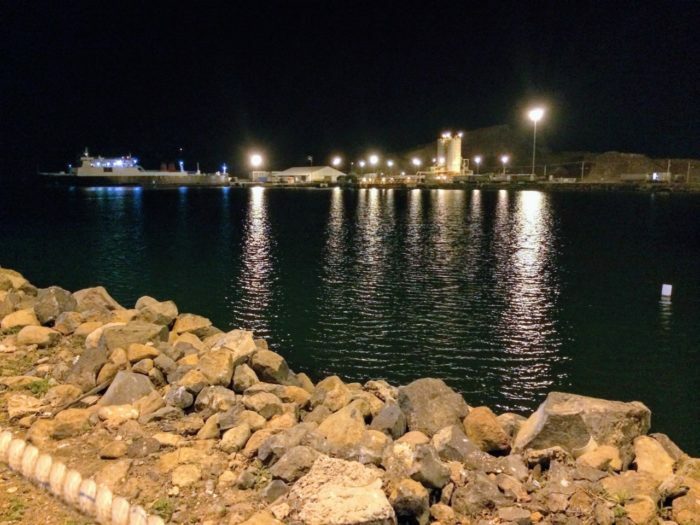 The departure time from Topolobampo is usually 11:59 p.m. However, the ferry times aren’t always consistent – I saw some departures at 11 p.m. and one at 2:30 p.m.
As I’ve said above – check for your particular dates. A note on the reverse route from La Paz to Topolobampo – this is usually a day ferry departing La Paz at 2:30 p.m. Important word: usually. Do check. How long does the Baja Ferry from Topolobampo to La Paz take? The ferry takes 7 hours. If you take the evening departure, the ferry leaves Topolobampo at 11:59 p.m. and arrives in La Paz the following day at 7 a.m…or thereabout. Taking the reverse route, you’ll hit Tompolobampo around 9:30 p.m. Overnight in Los Mochis and you’ll be well placed to take the Copper Canyon train the next day (assuming it’s a day when the train runs). What’s the best way to check the Baja ferry schedule and how can I buy tickets for the Baja ferry? Current record holder: longest amount of time taken to get hold of a ticket. When I was in Los Mochis on ancient wi-fi, it took me a day to figure out the schedule (captain’s whim), book a ticket and get confirmation. Ok, I didn’t help myself because a) I was being tight trying to avoid booking fees, so stuck fiercely to the Baja ferries website; and b) I was trying to book the day before the ferry, leaving little time to chase down an absent booking confirmation email (I didn’t get a reply/confirmation until a few hours before the ferry was due to depart – not ideal). When you are looking to book tickets, I’d do it before you leave home (you’ll get the cheapest fares that way, will most likely be on better wifi, and will have time to follow up if something goes wrong). Alternatively, you can book through a third-party website . prices aren’t that much more. The best website I’ve found is Direct Ferries – you can search for departure times and book tickets in minutes. How do I get from Los Mochis to Topolobampo? Topolobampo is a 30-minute drive from the centre of Los Mochis. I got my hotel to arrange a taxi for me. The cost is around $7-$9 USD. There isn’t a public transport option. Also, be aware that Uber can be more expensive in parts of Mexico. What is the cost of the Baja ferry from Topolobampo to La Paz? The price ranges from $1,100 to $1,800 pesos, around $60-$100 USD, one-way. You’ll need to book quite far in advance to get your hands on the $1,100 rate. Searching on Direct Ferries, the prices is about $1,484, around $80 USD, for a ticket the same or the following week. That is for a foot passenger ticket – expect to pay more for a cabin or if you’re travelling with a vehicle. What are the ticket/sleeping options on the Baja ferry? If you’re wondering where all the people are, I took this picture the next morning when they were all queuing to get off. You can buy a single or return ticket. The base fare is as a foot passenger and does not include a bed/cabin. However, you do get allocated a seat that is similar to a cinema seat but reclines. This is the option I went for. It was a bit more comfortable than a night bus seat and was quite a bit more comfortable than an economy class airline seat. The main downside of being in the main area for sleeping was the noise. My allocated seat was, in fact, in the cinema area, so I was subject to a loud Mexican movie, complete with passenger chatter fuelled by beer, for the first few hours of the journey. Not ideal given the sailing is pretty late to begin with. However, I wasn’t expecting the best sleep of my life and I always pack my ear plugs. If you want to lie flat and/or avoid the noise of others, you can upgrade to a 4-berth cabin. There are three options: an interior cabin, an exterior cabin or the most expensive, a suite cabin. You have to book the entire 4-berth cabin rather than being able to bunk in with others. Also, you need to book far (weeks if not months) in advance to get a cabin. Can you take a car/bike onboard? You can. 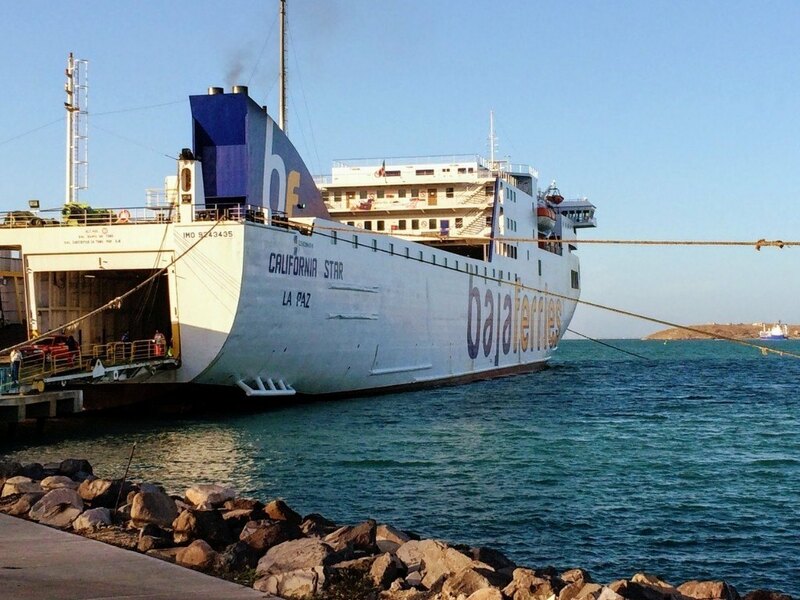 I took the Baja ferry as a foot passenger so I can’t talk about the experience directly but looking at reviews online, it seems that the best tip is to make sure you give yourself a lot of time to check in and expect a long wait to drive off the ferry. How long should I be at the ferry terminal before departure? And I was one of the last to board so I have no idea how long this queue would have been earlier on. I’d give yourself about half a day and I’m only half joking when I say that. I had an advance booking and had printed my booking confirmation. However, it still took close to two hours for me to advance through the ferry boarding queue. There doesn’t appear to be any particular reason why the boarding process should take so long except that every ticket purchased needs to be traded for a boarding ticket at the terminal. In my world (and also in Japan), this would be a very swift exchange. 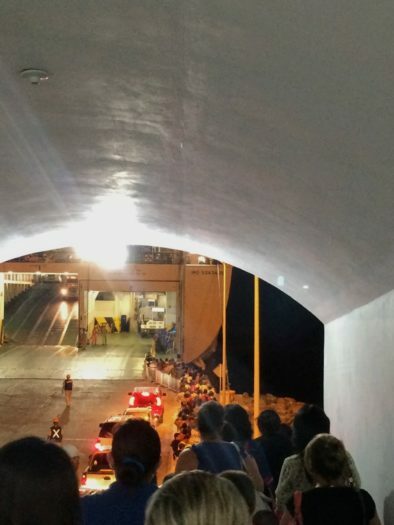 At Topolobampo ferry terminal, it seems to require two phone calls, a long exchange of dialogue, checking of reams of paper and a final phone call – for every single passenger. Anyway, it seems this experience is pretty universal – you can read about it on TripAdvisor here. Can you catch the ferry the same night as arriving on the Copper Canyon train? It’s hugely appealing to be able to roll off the Copper Canyon train and on to the Baja ferry that same night. However, all of the advice when I was looking at this combo was ‘don’t chance it’. That might seem strange on the page given the Copper Canyon train is slated to arrive into Los Mochis at 9:30 p.m. and the ferry isn’t scheduled to depart until 11:59 p.m. Personally, I would chance it, depending on whether you can afford to buy another ticket/book a last minute hotel if you don’t make the ferry. Just keep in mind that the train will probably arrive later than planned and, as mentioned above, the ferry can take an age to board. I’d be interested to hear if you make made this work and how many cats whiskers of time you had to spare. If you don’t cope well with travel stress, I’d overnight in Los Mochis. What about luggage onboard the Baja ferry? If you only have a foot passenger ticket or you don’t want to cram your luggage into your berth, you can stow your luggage. You hand it over when you get on the ferry and it’s stored in a locked cage. You’re given a luggage tag which you need to keep hold of, so you can get you luggage back at the end. So, don’t use the papery stub for your used chewing gum. It gets awkward later. Just saying. Also, don’t forget to decant everything you’ll need for the night into a smaller onboard bag. Although I wrote it for flights, you might find my list of overnight essentials useful. 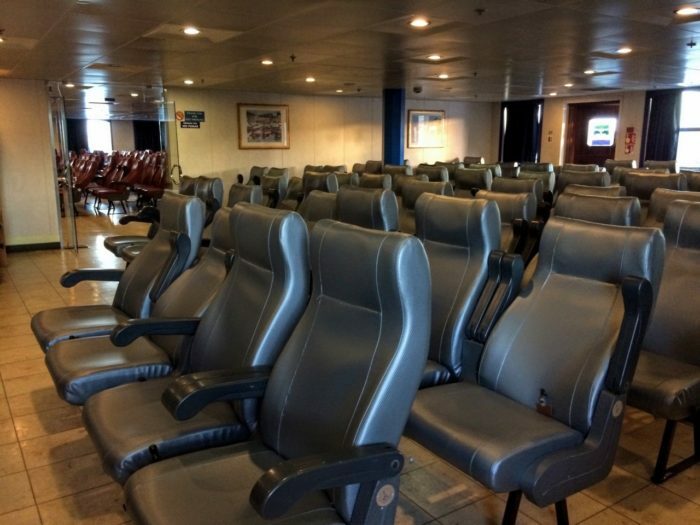 What it is like onboard Baja ferries? I was personally impressed with the ferry – it was large and had all the facilities you would expect – toilets (clean), a restaurant, a bar and, as I’ve mentioned, a cinema in my bedroom. Other reviews talk about there being live music and dinner served when you board. I didn’t experience either of these things. I may have missed out on the latter (dinner) because I was last onboard. And with a cinema in my bedroom, I didn’t feel much need to go and seek out other, potentially noisier noise. In terms of the sailing, it was smooth the whole way. 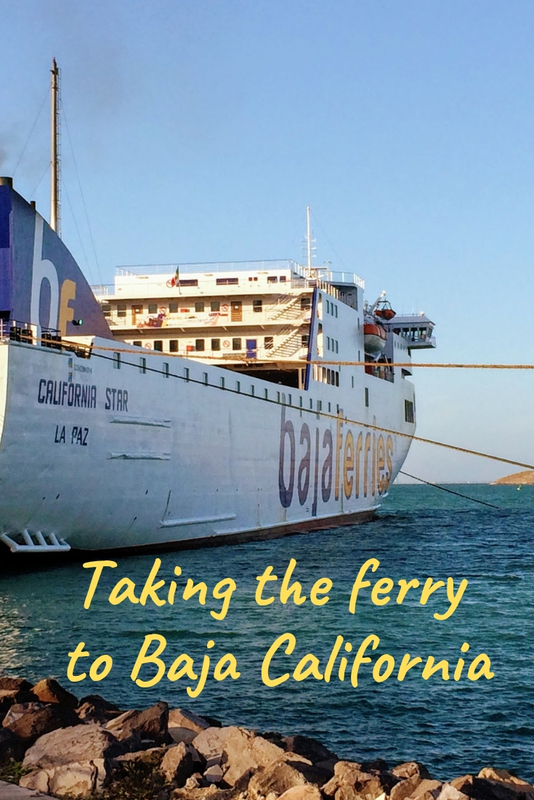 How do you get from the Baja Ferry to La Paz? Crossing from the mainland in Baja California, I started to see signs of the version of Mexico I’d had in my mind since I was a child. Arid landscape and cacti big enough to fight me. It’s around 20 minutes by taxi from the Baja ferry terminal in La Paz to the centre of La Paz. This should cost around $8 USD (taxis are more expensive on the peninsula than they are in Los Mochis). I managed to take the bus – there were several waiting when I got off the ferry and it dropped me at the main bus terminal in La Paz which is right on the main ‘strip’ (malecón). I’m afraid, due to the early morning and lack of sleep, I didn’t pay attention to the bus number. Instead, I had my accommodation address written down, showed it to one of the ferry stewards and he pointed me to the right bus. It’s a method I rely on a lot, that works 9 times out of 10. Hotel Fenix– this is where I stayed. Ideal if you’re on a budget (it was under $25 a night). Best Western Plus – if you want a bit more comfort, the Best Western is a good option in a central location. Ibis Los Mochis – an affordable, cheap brand in the centre of Los Mochis. Hyatt Place – a beautiful spot in the marina with a trusted brand that gets great reviews. La Perla – one of the most prominent large hotels that is slap-bang in the centre of La Paz. Hotel Lorimar – just a block from the sea, this is a great budget choice for under $50 a night. This is where I stayed. What about flights from Los Mochis to La Paz? It is possible to fly from Los Mochis to La Paz and at the time of writing, I found regular flights for under $100 USD (assuming a booking weeks and months rather than days in advance). I would recommend the ferry for the experience but if you’re short on time or energy, you can check flight prices here. Is it worth taking the ferry from Topolobampo to La Paz? How I felt after the adventure taking the Baja ferry – I never feel like that after taking a flight. 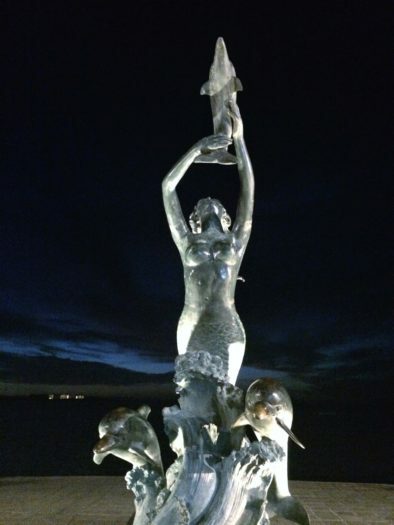 This is a statue in La Paz – you should check it out. You can open the map in Google maps here. So, that’s how to take the Baja ferry from Topolobampo to La Paz. Have you taken the route or do you have any questions? Let me know in the comments below.